Caroliner (formed in 1982, in San Francisco) is an Industrial Bluegrass/Experimental/Noise conceptual art Costume Rock band, dedicated to creating a fever dream of American psychedelia - utilizing bluegrass music instruments, weird effects, other-worldly pageantry, and day-glo character outfits similar to those of a "Disneyland ride with a Spike Jones and his City Slickers sense of individuality." For example, band member Puppy Whowoundup built an actual spinning heliotrope animatic cap that revolved on top of her head. Member The Brazen and Meticulous Pintle sports a spinning Brittleback wheel as a codpiece for her stringed instrument. "Caroliner is the sound of atrophy, the noise of salvation and damnation's collision in a parallel dimension to purgatory, the random rumbling of the bowels of the universe turned inside out to become a semblance of music complete with lyrical vantage points so convolutedly arcane to make comprehending them impossible, save for the few gnostically inclined aspirants bent in similar psychic permutations." According to the band, "Caroliner formed as a tribute band to the singing bull of the 1800s who had the same name. Influences include most and foremost The Skillet Lickers, Barrel Gordon Trio, and Dock Boggs, also making nods along the way to The Hoosier Hotshots, Spike Jones, Tiny Tim, and buckets of nails being kicked down the stairs. 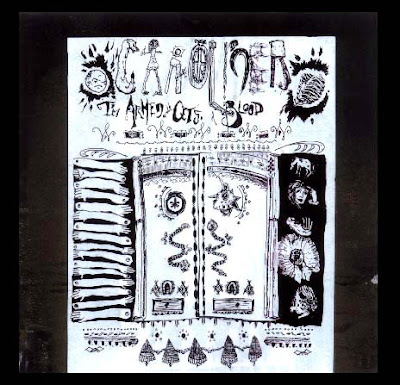 The Caroliner name stands alone (as seen on the cover of the organ based long play record "Toodoos"), to represent the band on most printed materials. The following "rainbow" word is only used when it is in conjunction with a line from Caroliner lyrics. The possibilities are endless: "Caroliner Rainbow Charlie Stink Creek", "Caroliner Rainbow Bowed Wart at the Turn", "Caroliner Rainbow Moth in the Waves", " Caroliner Rainbow Double Snap-Passion of Vaunted Elderly Fashion." Every 10 LPs results in a 'live' LP that sums up the next ten albums with some "songs in progress" between the live "hits"." "On top of the visual extravagance, Caroliner has somehow forged an original musical style. The songs typically fuse together a grinding, relentless bass line, country-ish banjo strummings, spastic vocals ranging across several octaves, a wheezing organ drone, and screeching violin tremolos. Despite the splintered aesthetic, a lumbering grandeur gathers ...... Space does not permit a description of the lyrics, which purport to interpret the prophecies of a 19th-century Wisconsin cow." Successful tours of Europe and Japan resulted in "stick to your gums" USA tours. The band is reportedly awaiting the "building of a horticulture twist spindle farm of 1844" for the next tour that will "hopefully include face roulettes", and fantastic new deformed sheep faced instrumentalists". Claiming the solitary influence of "Caroliner — the Famous Singing Bull of the 1800's," San Francisco's Caroliner is one of America's most original and difficult musical entities. Vaguely indicated by the tag "industrial bluegrass," the vehemently indescribable band consists of futuristic Luddites in the moral center of an avant-garde for erratic minds, covering turf wider than all alternative rock combined. The wealth of material ranges from shrill musique concrète to believable theater tunes, all pointing back to cowboy songs heard on dusty Victrolas. Behind an ever-shifting facade of pseudonyms stands the dictatorial "singer from Caroliner"; the band's only predictable element is that each hand-packaged record will be credited to "Caroliner Rainbow something of the something something," and will include a double-sided photocopied lyric sheet meant to be read along with the music. The band's mindset is better elucidated on I'm Armed With Quarts of Blood; the album has a Grand Guignol pop-up and bits of hair, dirt and cockroaches glued to the cover. It begins with four hysterical locked grooves, which the liner notes recommend be listened to for a solid week each before pressing forth. Catchy ditties like "Corn Red Moon" and "Barrel Horses & Window Crackers" describe extreme remedies for problems of mind and farm as errant fiddles squeal and lopsided voices caterwaul. A violent and twisted euphoria of the imagination. For me one of the milestones of modern rock experimentalism! Note: link removed, as this is effectively still in print and can be had via Revolver Distribution Here. Looks like you may have problems with these three new uploads in Massmirror. I got into it by changing address to s1.massmirror instead of s2 - the links given only lead to error messages. Thanks for posting this. I once saw an ad in the classifieds of a music magazine that read something like, "Ever feel like a cat on fire and self-urination was your only hope? Send one dollar to..." With a come-on like that how could I resist? I sent my buck and got back a cassette single from these guys. I also have their "Scramble Egs Taken For A Wife" album. Great stuff. very nice! thanks for this one. This lp is actually still in print by one of the main distributors subterranean.org. Brutalsoundeffects.com should carry it also. There are about 200 lps left of this. Bonnie speaks true, I just recently ordered this. excellent post...I believe the date of this recording is more like 1989...might I request that you post 'the sabre waving saracen wall"? I second that, it is one of my favourite records. Everthing in only 1 generation. - Tudo em 1 só geração. O Maravilhoso Carpinteiro que se fez pecado no inferno é Completamente Benígno e está Justificado pelo o Deus Vivo Espírito Santo Marcele Castro Da Veiga, que o ressusitou dos espíritos mortos que estão nas profundezas da morte no abismo das trevas. 1. Em uma só geração induzidos ao erro os inocentes Eva e Adão caíram e morreram eternamente, mas. 2. Em uma só geração o Novo Adão Etéreo, resgatou do erro eterno, a Eva e a fez Nova e se levantaram. 3. Também em uma só geração no tempo final se Manifestou o Casamento Celestial Eterno, Uma Nova Terra/Céu/Cosmo Incorruptíveis são Confirmados para sempre, em Fiel Puro Amor, no Único Deus Vivo Espírito Santo da Justiça. Visit the link given here immediately!